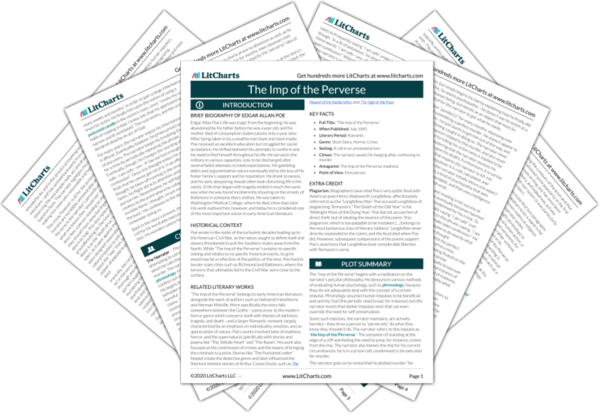 Instant downloads of all 945 LitChart PDFs (including The Imp of the Perverse). 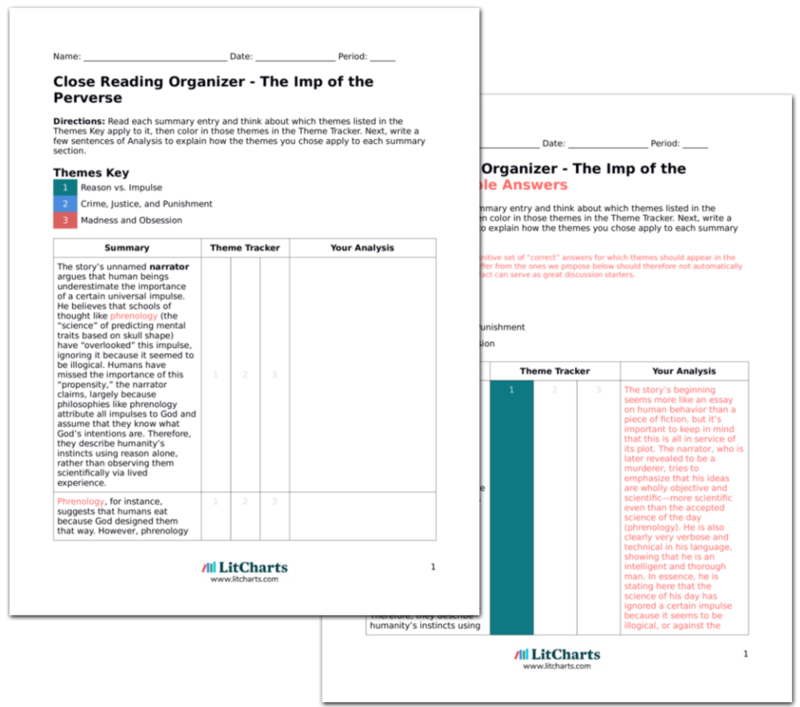 Welcome to the LitCharts study guide on Edgar Allen Poe's The Imp of the Perverse. Created by the original team behind SparkNotes, LitCharts are the world's best literature guides. A concise biography of Edgar Allen Poe plus historical and literary context for The Imp of the Perverse. A quick-reference summary: The Imp of the Perverse on a single page. In-depth summary and analysis of every of The Imp of the Perverse. Visual theme-tracking, too. Explanations, analysis, and visualizations of The Imp of the Perverse's themes. The Imp of the Perverse's important quotes, sortable by theme, character, or . Description, analysis, and timelines for The Imp of the Perverse's characters. Explanations of The Imp of the Perverse's symbols, and tracking of where they appear. An interactive data visualization of The Imp of the Perverse's plot and themes. Edgar Allen Poe’s life was tragic from the beginning; he was abandoned by his father before he was a year old, and his mother died of consumption (tuberculosis) only a year later. After being taken in by a wealthy merchant and slave trader, Poe received an excellent education but struggled for social acceptance. He drifted between his attempts to conform and his need to find himself throughout his life. He served in the military in various capacities, only to be discharged after several failed attempts to meet expectations. His gambling debts and argumentative nature eventually led to the loss of his foster family’s support and his reputation. He drank to excess, and his dark, despairing moods often took disturbing life in his works. A life that began with tragedy ended in much the same way when he was found incoherently shouting on the streets of Baltimore in someone else’s clothes. He was taken to Washington Medical College, where he died a few days later. His work outlived him, however, and today he is considered one of the most important voices in early American literature. 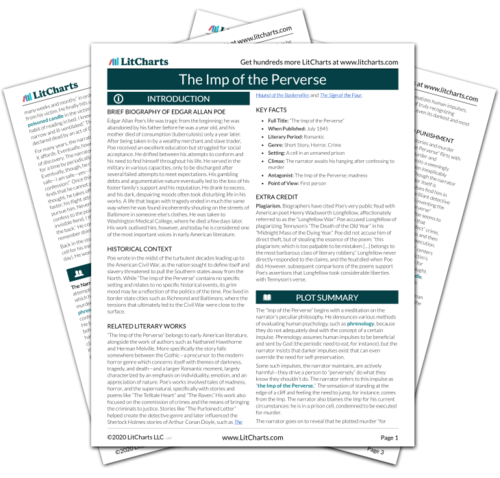 Get the entire The Imp of the Perverse LitChart as a printable PDF. Poe wrote in the midst of the turbulent decades leading up to the American Civil War, as the nation sought to define itself and slavery threatened to pull the Southern states away from the North. While “The Imp of the Perverse” contains no specific setting and relates to no specific historical events, its grim mood may be a reflection of the politics of the time. Poe lived in border state cities such as Richmond and Baltimore, where the tensions that ultimately led to the Civil War were close to the surface. “The Imp of the Perverse” belongs to early American literature, alongside the work of authors such as Nathaniel Hawthorne and Herman Melville. More specifically the story falls somewhere between the Gothic—a precursor to the modern horror genre which concerns itself with themes of darkness, tragedy, and death—and a larger Romantic moment, largely characterized by an emphasis on individuality, emotion, and an appreciation of nature. Poe’s works involved tales of madness, horror, and the supernatural, specifically with stories and poems like “The Telltale Heart” and “The Raven.” His work also focused on the commission of crimes and the means of bringing the criminals to justice. Stories like “The Purloined Letter” helped create the detective genre and later influenced the Sherlock Holmes stories of Arthur Conan Doyle, such as The Hound of the Baskervilles and The Sign of the Four. Plagiarism. Biographers have cited Poe’s very public feud with American poet Henry Wadsworth Longfellow, affectionately referred to as the “Longfellow War.” Poe accused Longfellow of plagiarizing Tennyson’s “The Death of the Old Year” in his “Midnight Mass of the Dying Year.” Poe did not accuse him of direct theft, but of stealing the essence of the poem: “this plagiarism; which is too palpable to be mistaken […] belongs to the most barbarous class of literary robbery.” Longfellow never directly responded to the claims, and the feud died when Poe did. However, subsequent comparisons of the poems support Poe’s assertions that Longfellow took considerable liberties with Tennyson’s verse. Vaux, Rob. "The Imp of the Perverse." LitCharts. LitCharts LLC, 6 Apr 2019. Web. 23 Apr 2019. Vaux, Rob. "The Imp of the Perverse." LitCharts LLC, April 6, 2019. Retrieved April 23, 2019. https://www.litcharts.com/lit/the-imp-of-the-perverse.